Topics: Get A Quote, Accessories, Bathroom Furniture, Bathroom Taps, Baths, and Designer Radiators. Age: It went live on September 1st 2003, making it over 14 years, 7 months old. 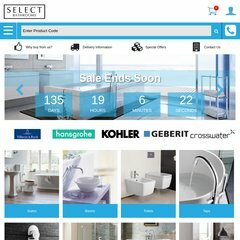 selectbathrooms.com Select Bathrooms : Manufacturers - Heritage Bathrooms - Shower ..
selectbathrooms.com Select Bathrooms : Adamsez, AEON, Aestus, Airbath, Appollo, April ..
selectbathrooms.com Select Bathrooms : Manufacturers - Duravit - Sanitaryware ..
selectbathrooms.com Select Bathrooms : Products - Sanitaryware - WC Cistern & Seats .. It is hosted by Titan Internet Ltd (England, Essex,) using Microsoft-IIS/7 web server. The site is programmed for ASP.NET. ns1.titaninternet.co.uk, and ns2.titaninternet.co.uk are its DNS Nameservers. PING www. (217.77.181.45) 56(84) bytes of data.